The Doom That Came To The Doom That Came To Atlantic City | Kris Johnson's Blog…sort of. I’m 9 for 10 on backing Kickstarter projects, and thus far I’ve been pretty lucky as far as reward fulfillment goes: I reserved my Ouya username, received some Goon digital comics, my copy of Project Ninja Panda Taco is on a bookshelf upstairs, Matthew Wayne Selznick’s Pilgrimage is on my Kindle (I expect my physical copy to arrive any day now), and Shadowrun Returns should be installed on my PC by this time tomorrow. One more project has promised reward delivery this year and then I’ll have to wait until various points in 2014 and beyond for the other three. Hopefully, none of them will turn into the train wreck that is The Doom That Came To Atlantic City! , a board game that not only met its $35,000 funding goal, but more than tripled it. More than 1,200 backers pledged over $120,000 to this Cthulhu/Monopoly mashup a year ago, and yesterday the campaign creator ((Actually would-be publisher The Forking Path. Keith Baker and Lee Moyer, designers of The Doom That Came To Atlantic City! , did not create the Kickstarter campaign.)) announced that the game had been canceled. The backers—some of whom were surprised that their money was spent on an ill-fated attempt to “launch a new board game company” rather than simply covering manufacturing costs of a game that had been in development for the better part of two decades—are understandably upset. The video and all other material on the Kickstarter campaign page focus on getting The Doom That Came To Atlantic City! printed; nowhere is “launch a new board game company” mentioned. The comments section of the “Terminus” update is filled with information on how to file a fraud complaint depending upon where you live. 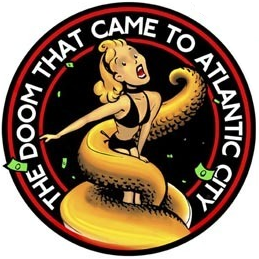 More than 400 people pledged $100 or more to fund The Doom That Came To Atlantic City! Updates from The Forking Path in late 2012 gave the impression that the game was at the printer in China. What went wrong? The details are vague, to say the least, but Erik Chevalier, who appears to be the sole voice of The Forking Path has promised a detailed post-mortem and has made a pledge to return backers’ money out of his own pocket. Rights to The Doom That Came To Atlantic City! have reverted to Baker and Moyer, who have offered (in a statement on Baker’s blog) to make a print-and-play version of the game available to Kickstarter backers as soon as possible. I didn’t back The Doom That Came To Atlantic City! , but thanks to its implosion I am now more aware than ever of the $120+ “investment” I’ve made across four projects that, collectively, raised more than $5 million and hoping that the next update I see in my inbox won’t be one of those trains derailing. One failed project (no matter how spectacularly or heinously it fails) doesn’t necessarily reflect poorly on Kickstarter as a whole (they’ve gotten some other less-than-wonderful press in the past couple of months), but that won’t stop me from thinking long and hard the next time my cursor hovers over that “Back This Project” button.